Today is the best day of Mari’s life. She is about to receive a gift beyond her wildest dreams – a house. 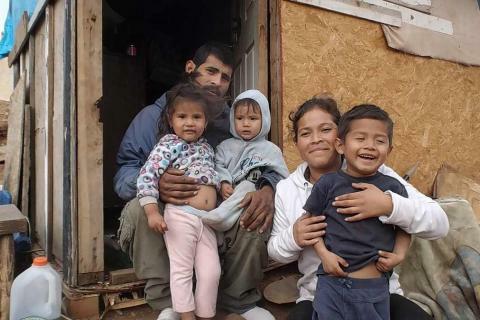 The 16ft x 20ft house with a loft, a concrete floor, four sturdy walls, and a leak-free roof is more than this single mother of three could ever have imagined for herself. I had the great privilege to spend this day with her, and watch her dreams come true before her eyes. At 6 am on Saturday morning, when I would normally be in bed, I was on my way south of the border to Tijuana, Mexico. With 25 International Relief Teams’ volunteers, all sacrificing their weekend and precious time with their families to give one family a better future, we caravanned in three large vehicles across the border to the newly-formed settlement community of Colonia Fuentes del Valle. 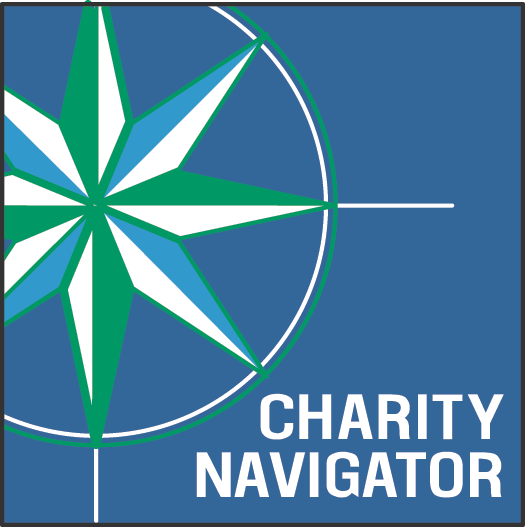 As we approached the community, we bumped along a dirt road, spraying large dust clouds behind us and drove into a sea of small shacks made from scrap materials. One hundred and fifty families now live here, mostly migrants from central Mexico searching for better opportunities. 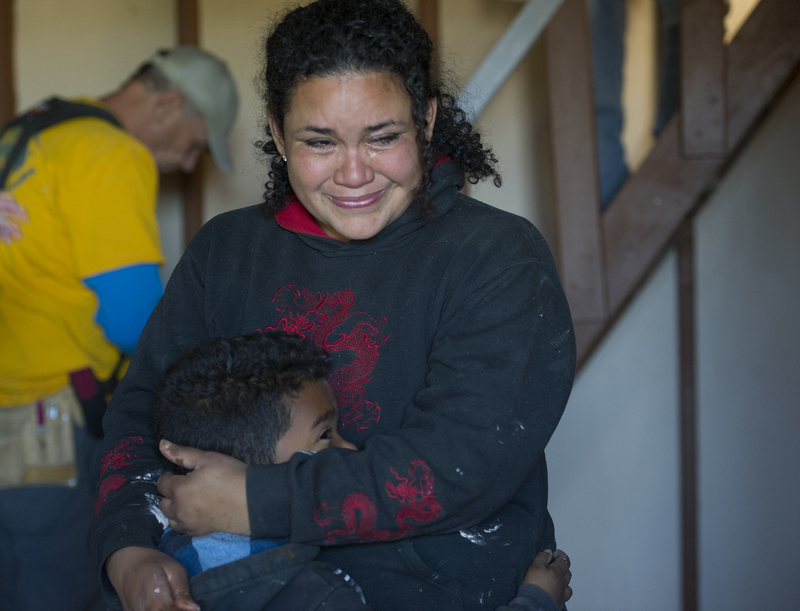 The cost of living, school expenses, and low wages often leaves these families with insufficient funds to build houses. 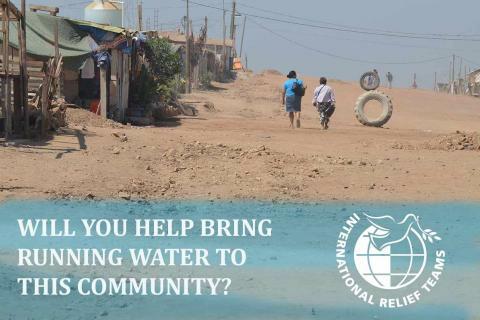 There is no running water, sewer lines, schools, or medical services. When we pulled up to Mari’s small plot, I saw her standing in front of her shack with a gaggle of excited kids and neighbors, all waiting anxiously for our arrival. Her eyes glimmered with tears when I introduced myself – she couldn’t believe we were all here just for her. 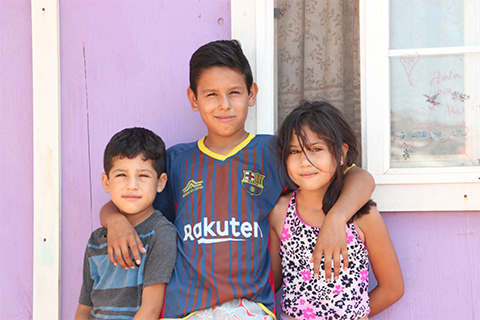 ‍Mari with Kevin, Dulce Abril, and Emmanuel in front of the home where they have lived for the last year. Mari’s current home is a tiny two-room structure made of old garage doors, tarps, and with dirt floors. While the volunteers got to work on the construction, Mari showed me around. We sat in the “kitchen”, a space just big enough for us to stand in, while children filed in and out, running and yelling in excitement. The room has a kid-sized table with two chairs, and an improvised countertop with a single pot filled with ears of corn ready to be made into tamales later that day. Mari said cooking in a kitchen with dirt floors meant it was impossible to keep dirt out of the food. Next, Mari took me outside and into the “bedroom”, a room not much bigger than the kitchen and which only contained a single bunkbed. Mari explained she used the top bunk to store their clothes and all four of them slept together on the bottom bunk. Sleeping on the bottom bunk also helped protect them from getting wet when it rained. Mari’s children, 10-year-old Kevin, 6-year-old Dulce Abril and 4-year-old Emmanuel, each told me they were most excited about sleeping in the loft in their new house that night. Dulce Abril (which means Sweet April) clung to her mother when she wasn’t running around with the other little girls. 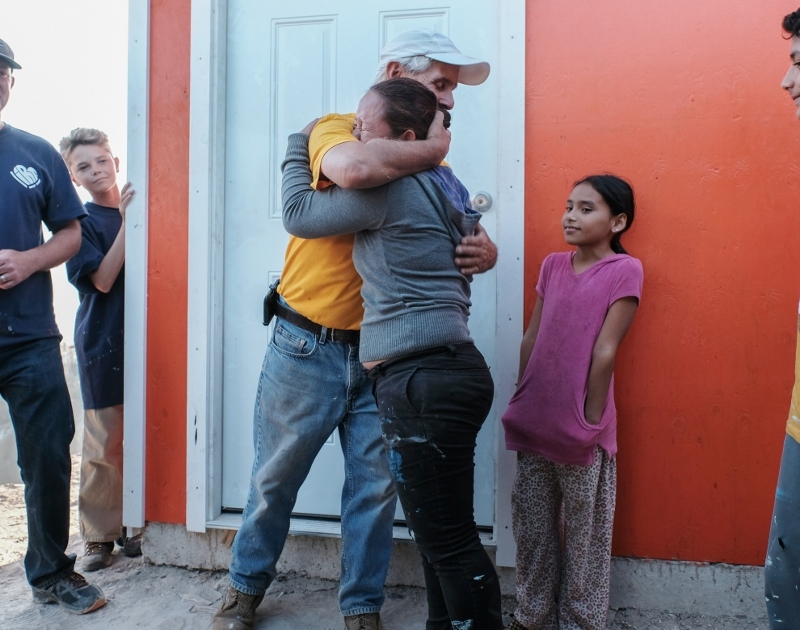 After spending the whole day with this family, I noticed the four of them never strayed too far from one another – they even helped paint the frames of their new house together. They have a very special and sweet bond. Sleeping in a single bed together every night is bound to do that! Mari then told me her story, her eyes shining with tears as she remembered the hard times. She was born in Mexico City but was raised in Tijuana. 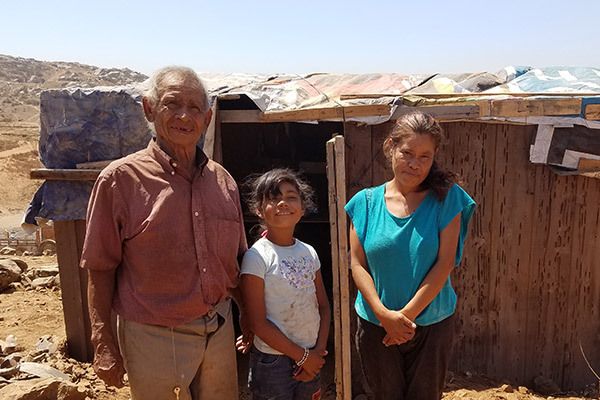 When Mari’s mother came to visit later in the day, she told me she moved her family to Tijuana because she knew she could find a job here, and has been able to work in a factory building electrical plugs to support her family. When Mari was 18, she met the father of her children and had Kevin, followed by Dulce, and then little Emmanuel. They split up over six years ago and Mari has been a single mom ever since. About a year and three months ago, she decided to move out of her mother’s house because she wanted to have her own space for herself and her kids, as her mother’s house was very crowded. Mari, at 28, is the oldest of seven children. 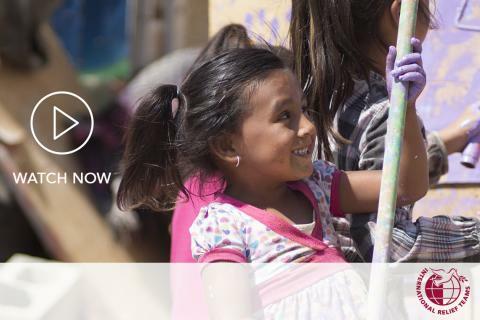 Mari moved to Fuentes del Valle with two of her sisters when the neighborhood was just starting out. ‍Mari’s mother with one of her 10 grandchildren. Mari said she feels lucky to have her family close by to help her raise her children. Mari said she makes her living by selling beauty products and doing odd jobs for her neighbors to earn a few extra pesos. Dulce called herself “my new best friend” throughout the day. Here we are taking a selfie in front of her old house. 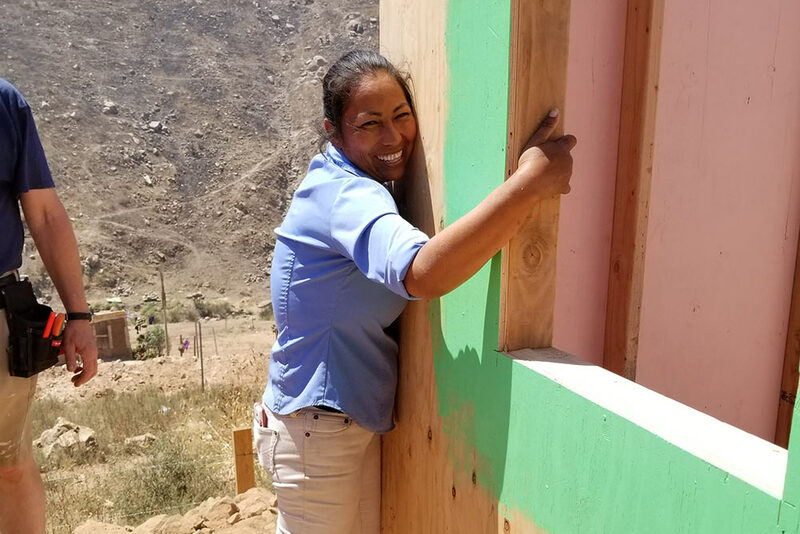 Throughout the day, Mari and I watched the IRT volunteers raise the walls of her new home. 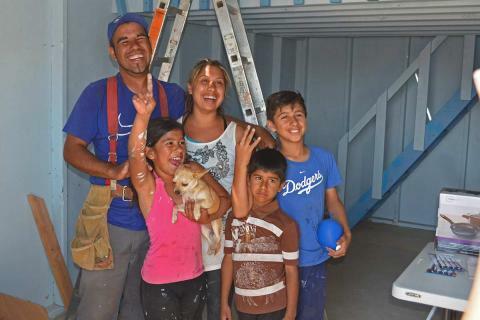 We watched them roll on the bright purple paint (chosen by Dulce Abril), install the roof, hang new curtains, set their new table with their new plates, cups and silverware, and set out the new blankets and pillows in the loft. ‍IRT construction volunteers build the roof on Mari’s new house. Then the time came for the family to check out their home for the first time. Mari’s eyes gleamed, as they had all day, and the kids looked like it was Christmas morning. ‍The family steps inside their new home for the first time. I was amazed when Dulce squealed with delight over her brand new pillow – she never had a pillow before. “I will sleep well for this first time in my life tonight because I finally have a pillow,” she said. 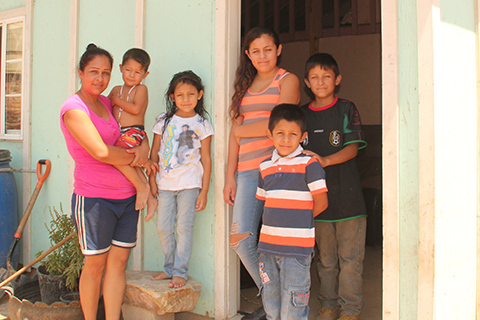 ‍The IRT 25-volunteer team, Mari, and her kids stand in front of the newly-built house at the end of a long day. At the end of the day, when I handed the keys over to Mari, she could hardly find words to express her gratitude through her tears. She said she felt hopeful for her children’s future for the first time. She knew this house would help keep them protected from the wind and the rain. It meant dirt would not get in their food. It meant they would sleep well at night and would be ready to concentrate at school the next day. It meant hope for a brighter future.